Interesting article in the business section of the Sunday Post about how China is making big investments in infrastructure. Building huge cities in some of the poorest and most remote areas of the country, along with the high speed rail system to connect them. We got a very small glimpse of this change while riding those trains during a trip earlier this year. Large blocks of high rise apartments and other buildings, seemingly in the middle of nowhere. All of this is part of the government’s plan to spread their economic success to areas other than the traditional business centers like Shanghai, as well as pushing the overall manufacturing focus beyond producing inexpensive goods for the rest of the world. It is far from certain that such a challenging plan will work. But one line from the piece really summarizes what is happening in China, and offers a lesson for us here on the other side of the Pacific. 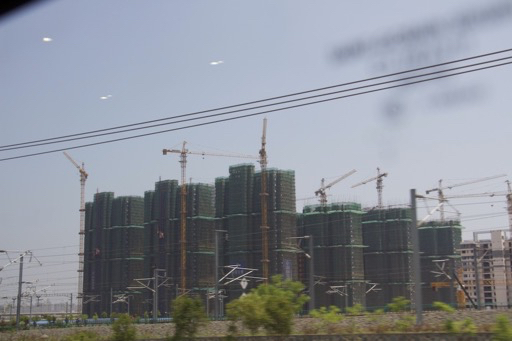 Whether it is Beijing’s ring roads, Shanghai’s subway lines or Lanzhou’s high-rises, China has not built what it needs today, but what it will need tomorrow. The United States used to build for the future. Instead of wallowing in the arguments of the past. On the last day of this tour, having had little time for shopping over the past two weeks, some of us (meaning my wife and her friends) decided to skip the scheduled tour and hit the streets. 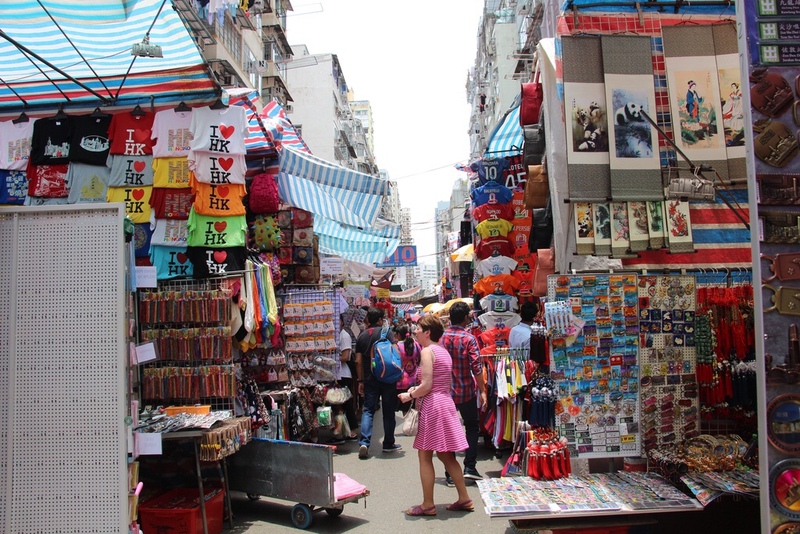 We wound up at the Ladies Market, two blocks of stalls full of interesting items, most of somewhat questionable origin and prices that are only a starting point for haggling. I just wish they offered free wifi. 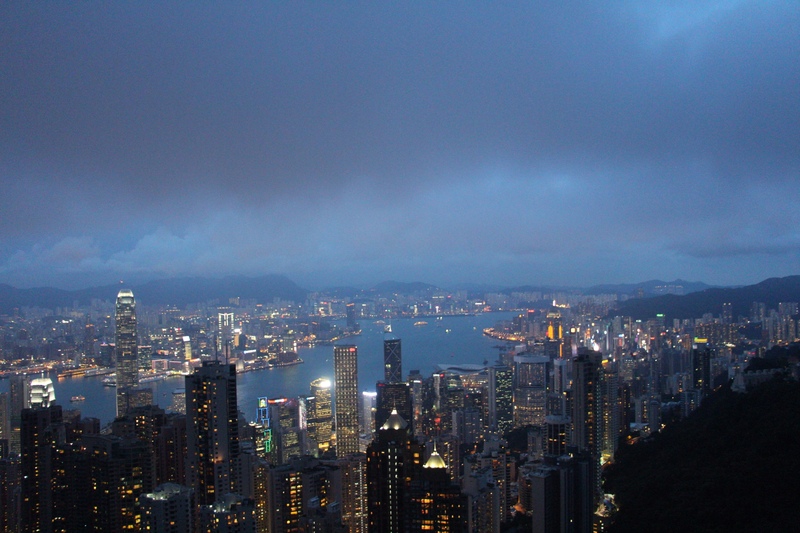 Later in the day I made my way to the tram that takes passengers to the top of Victoria Peak, the highest point on Hong Kong Island and a trip all the guide books say every visitor to the area should make. So, what do you find at the top? A shopping center, of course, one that includes the very American Bubba Gump Shrimp Company. However, you also get this incredible view of the city. In a few hours we start the long journey home. At least it’s not on Air China this time. 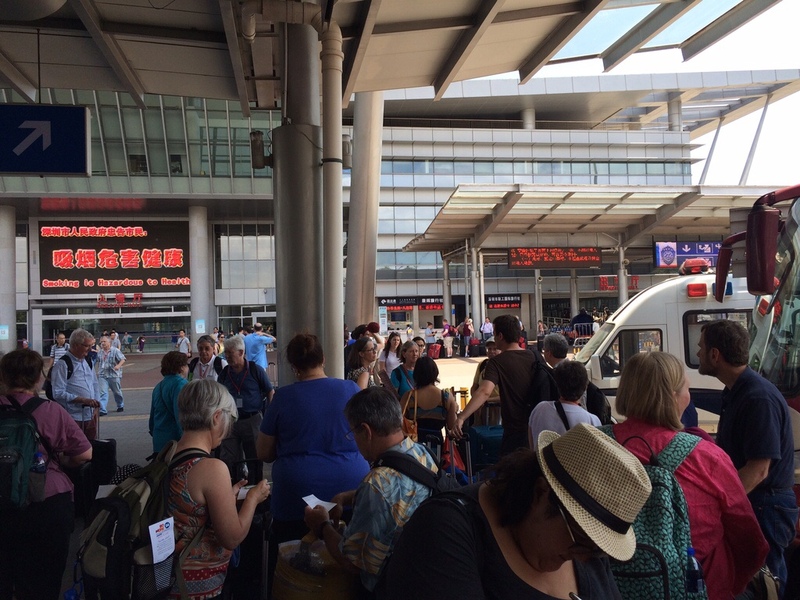 Our tour today took us from Guangzhou to Hong Kong by bus, a trip that should have taken about 2 -1/2 hours except for a roadblock thrown up by the Chinese government. I was under the impression that in 1997, when the British lease expired, Hong Kong became part of China again. However, they seem to be treating the area as a different country, complete with this border crossing facility where we had to take our luggage off the bus and go through an immigration and customs control process. Most of which consisted of standing in line, stern looking people comparing our documents to a computer screen, and stamping forms. 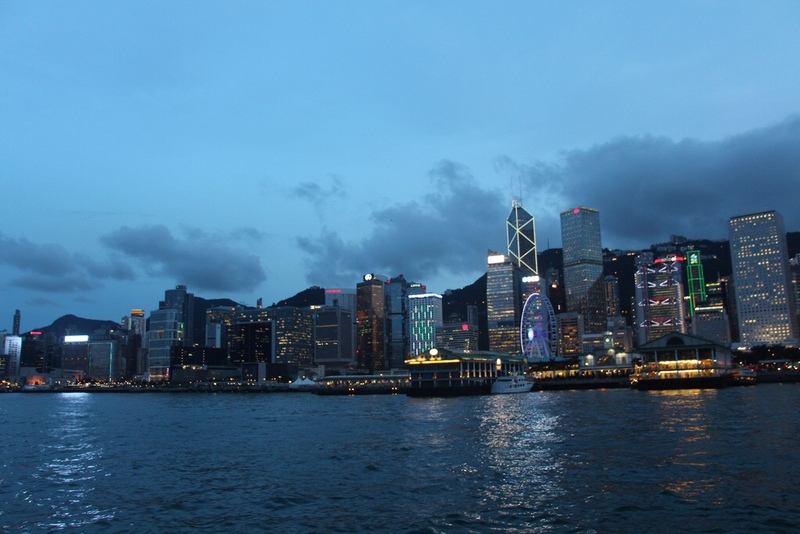 Anyway, we spent the rest of the afternoon and evening exploring the area, taking the Star Ferry across the harbor to Hong Kong Island (we are staying in the Kowloon district) to get a panoramic view of their iconic skyline. More time to look around today and I’m looking forward to taking the tram up to Victoria Peak tonight. Today was another where we got to see multiple sides of China and I’ve had a hard time picking two shots to represent the day. I’m on my third 64gb memory card so it will take a while after we get back to sort through all the images and post some sets. 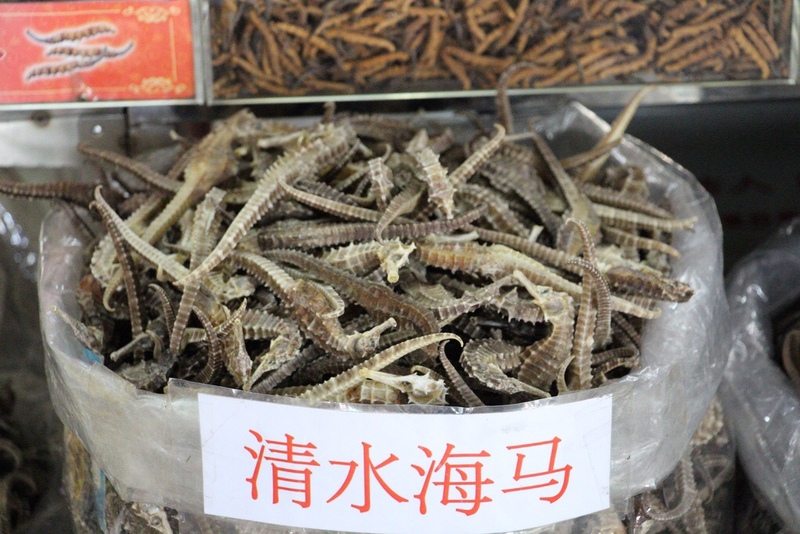 Anyway, during one of our walks this morning we passed through a market with stalls offering the raw ingredients for traditional medical treatments, like these dried sea horses. Probably no coincidence the market was right next to a hospital. Our guide said that most people in the country still depend on home brew remedies since the health system cannot handle the demand. 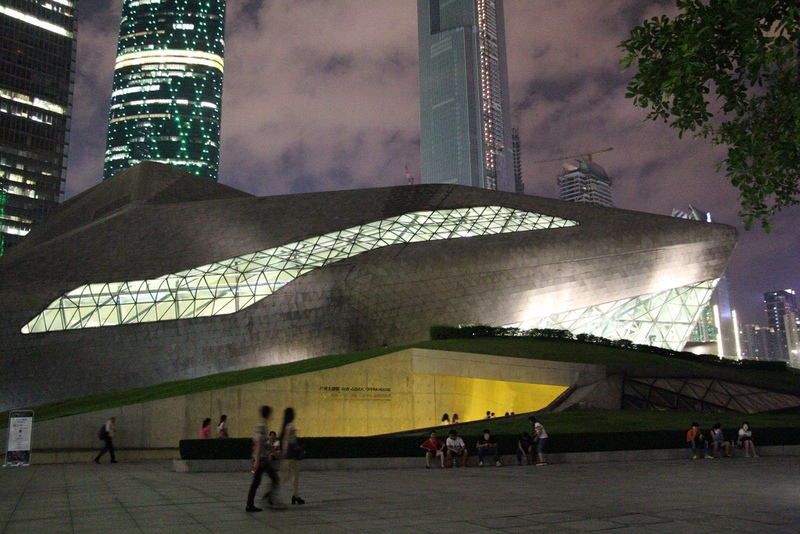 Then here’s another side of Guangzhou, the opera house in which the choir I’m traveling with performed last night. Looks a little like a space craft out of any number of scifi movies or TV shows. And it’s very low profile compared to the surrounding buildings which, as in all the cities we’ve visited, are massive and don’t skimp on the LED lights. BTW, you can catch Riverdance here in July. NextÂ we head to Hong Kong, our final stop on this tour.